It’s convention week!! Hello and good afternoon RTV. It’s virtual tour convention week here in beautiful Traverse City, Michigan. The temperature this week is going to be in low seventies and high sixties. While there won’t be any swimming, or wake boarding behind the RTV Donzi Boat, the Park Place Hotel has a wonderful dome shaped glass windowed pool, a hot tub, tanning booth, and a sauna for you all to enjoy. At least we won’t be making snowmen like we did at last year’s convention. We’re working very hard to prepare for all you virtual tour providers coming to the show, and also working very hard chopping through the final edits to the new RealTour Fusion virtual tour platform. We’re currently still standing at about sixty edit requests to the new system so please be patient with us as we work through these and launch. For those of you who already have a Fusion account setup. Please note that your login access point has been moved. Please check today’s email for the new access point. We’re setting it up this way so we have a universal access point for all user types. Additionally we’re now using your email address as your username in the system and the system will automatically detect your user account type. If you have trouble logging in please contact Julie Lynn at the number below. For those of you who do not yet have a Fusion beta account setup yet please feel free to call in and get yours setup this week. Especially if you’re attending the convention. To get your own Fusion beta account setup, please contact Julie Lynn at 231-947-0684. She will open up your account and put in some tour credits so you can try out the new system. There is no cost to setup a beta account so be sure to call in. We’re going to be taking your setup requests in the order in which you call in and also giving preference to those attending the convention since those individuals will need their own accounts for training on the new system during the convention. It’s looking quite nice! Finally and most importantly, today is the last day you can purchase your tickets to the convention as we’re submitting our final head count to the Park Place. Register here if you have not already done so: https://www.realtourvision.com/VirtualTourConvention.php I believe the Park Place Hotel is at full capacity or very close. Not to worry however since there are many other hotels nearby for you to stay at. In fact there’s a Holiday Inn within walking distance from the Park Place. That’s all for now. See you soon convention attendees!! For those of you not attending the convention we’ll be making a DVD of the convention events and classes for you to purchase. We’ll also be holding this year’s first episode of The FORMULA and The IMAGE immediately after Fusion launches so I’ll plan on seeing you on the shows. Thank you all for your continued support and dedication to our product line. PS. We don’t really have a Donzi. times before it clicks. Remember that!! If you have a custom marketing piece that you would like to have prepared for you please don’t hesitate to ask. 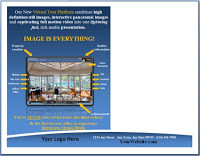 We’re here to help you build your virtual tour business. Login now to your www.RockPointeMarketing.com account and snag this fresh new piece. Good luck out there! This year the area commemorates 150 years since several Civil War battles were fought in the area. In April, Shiloh, TN., saw it’s 150th year reenactment festivities. This October, it will be 150 years since the Union Maj. Gen. William S. Rosecrans defeated a Confederate army, this time one under Maj. Gen. Earl Van Dorn. The town has wonderful centers for one to explore the history of these famous battles. There is the “Interpretive Center”, a museum that is a must see in learning about the war’s conflict, before driving a short distance to Shiloh’s battle field. There is the Railroad Museum, providing additional local history. Pizza Grocery Virtual Tour Located in a old historic building, it is the best pizza in town! Other specialties are available. Enjoy fine dining in the evenings. Coffee, sandwiches, smoothies, soup….and more go to KC’s Espresso Virtual Tour. Come to Corinth. Incredible place to visit and eat. In one of our previous posts we talked about why starting a virtual tour business and why adding a virtual tour department onto your existing business would be a great option for you to make some extra income. Today I want to talk to you about some of the basics for those of you who may be new to the idea of running your own business. Understandably, if you’re not currently living the entrepreneurial lifestyle, the idea of starting a virtual tour business on the side may seem scary, expensive, and like a whole lot of hard work and effort that you don’t have time for. The fact however, is it can be fun, easy, and very inexpensive to do! I have put together some ways that you can easily and most importantly inexpensively promote your new virtual tour business to make the most of your time and money. Read these few steps, talk to some other RTV virtual tour providers back here and you’ll see they all started out, to some extent, following the basic steps below. #1 Flyers and business cards. You would be surprised at the places you’ll find the new clients for your virtual tour business. Being a business owner means always being prepared. Printing out bulk orders of flyers, brochures and business cards from VistaPrint is affordable and a necessity for always being on your game! At BlueLaVaMedia we also use interactive CD Handouts. 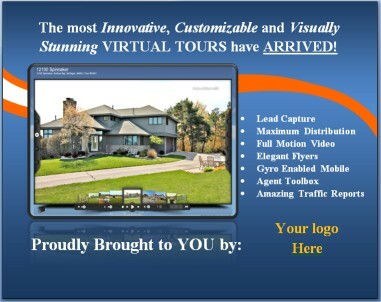 These are a great way to put an actual HD virtual tour along with some brochures, a link to your website and more into the hands of prospects. It’s a proven fact that CD’s have a longer shelf life than a flyer. All the above are great to have when you meet an interested real estate agent or restaurant owner in line at the grocery store or at the gym. You will likely lose the lead if you don’t have a business card to hand to them right away. Always carry them around in your wallet, gym bag or purse so they immediately have your contact information! #2 Websites & Registering. We have held many RTV talk shows on the right things that you need to do to setup your business and one of the first on that list is to get a website. There are many ways to obtain a website even if you don’t know how to create one yourself. At RTV we do provide a free website with our system but you can always purchase a ready to go virtual tour website http://providers.realtourvision.com or create one on your own. Some sites have very inexpensive and easy to use templates and design programs that will take you on a step by step guide to getting started. Once your website is up take some time and watch some of our other talk shows on SEO and blogging to start building strong virtual tour centric back links to your site. #3 Cold Calling. Once you’re ready to start finding your virtual tour clients and have established your target audience in your area, make a list of businesses to call and let them know about your services. You can do this from the comfort of your own home. Just sit back and think about your favorite local hangouts such as your gym, your dentist, animal clinic, coffee shop, hair salon, restaurant, and so on. You will find that making this list is fun and once you get started you will be surprised at how many local business owners you already know and enjoy talking with. Making a few calls a day to potential leads can help get the word out about your virtual tour company. Ask if you can send them an e-mail if they don’t have time to talk and make sure to put your Facebook link and website link in the signature of that e-mail as well. Let me tell you (and I’m speaking from my own experience from running a Traverse City Virtual Tour Company now for four years) owning your own virtual tour business is very rewarding and fun. There are so many options for new businesses out there today and utilizing the internet is a whole advertising plan in itself. We are always here to help you in your journey with us. When you come aboard with RTV, you are never alone; you’re in the network! 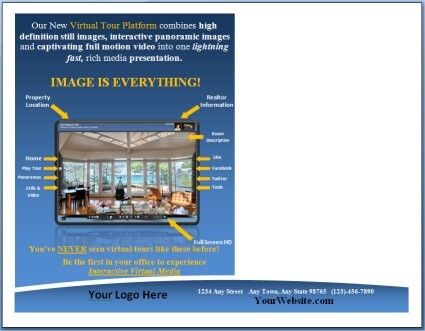 You are in the virtual tour business. You are making money. You are spending money. These three facts are true. Are you getting your money’s worth out of the spending? Are you using a credit card to buy your products, your monthly website subscription, your insider subscription, your virtual tour credits, your Realtor.com inserts, your supplies, etc. etc, the list goes on. You are spending a fair amount of money if you are being successful. What do I mean by ‘getting your money’s worth’. I don’t suppose that many of you just throw money away carelessly, but the fact is that you may be doing it unknowingly, or at least leaving it behind. If you are using a credit card AND you are paying off your bill COMPLETELY each month, you, first of all, are not paying credit interest and that is the equivalent of a small loan by the credit card company each month! Of course, don’t pay late or it’ll cost you. Best to have automatic payment or debited by the credit card company to your bank each month. That way you won’t forget. Next if you are not using a rewards card, you ARE NOT getting your money’s worth out of your spending. I.E. you are leaving behind something worthwhile, be it air miles, discount, cash back, etc. Now you may be saying, ‘oh, geez, its only a little each month and it won’t ever add up to anything. WRONG! WRONG! WRONG! I have been using an AMEX Delta card for as many purchases as I can,(some places don’t like AMEX). That is the first of my strategies. Second is that no matter what, the monthly balance is paid in FULL each month. What does that do for us? Well, if you are putting almost all your monthly debt, on the right plastic, you may find you are adding up thousands of points per month. For most continental US flights, 40,000 points will take you somewhere and back. Example, the cost to fly to the virtual tour convention from San Antonio to Grand Rapids & return would cost us (2) about $1000. The cost to us: 80,000 points which comes out of our over 340,000 points we have accrued over the years. Don’t say it! We haven’t had to save this up for years and years and years. In fact I’ve flown to Europe twice using sky miles and the wife and I flew to Hawaii on vacation using sky miles. You can do it too! Think of it this way, you spend money buying your materials from RTV and in return, RTV is helping you (us www.alamoareavirtualtours.com) get a ‘free’ trip to the convention each year. Now that’s what I call getting your money’s worth! !